9 Practical Issues in Your Wetroom Decision. Niall Byrne, Living Spaces Ltd, niall@livingspaces.ie. February 2015. Wetroom Bathroom -- Is It The Right Bathroom Design Choice? If you’re dreaming of the most beautiful bathroom possible in your home, you really need to consider all the design options and practical options open to you, and the practicalities of your living space and home. But where should you start? What are the kinds of things that will influence you and should be considered to make the best choice for you? In this article, I am going to highlight some of the key decisions facing you, and give you some hints and tips along the way. A recent survey in the United Kingdom found that a stylish wetroom increased the value of the property by an average of €10,000. That’s good value for sure. Is a Wetroom Right For My Home? A Wetroom can look fantastic in any number of designs, whether your style is contemporary, classic or somewhere in between. They’re not always about minimalist design; the facts are that not everyone wants this look, and ‘looks’ come and go over time. What’s trendy now might not be on trend in 12 months’ time. The answer; go with your own design and style, the bathroom will be a big part of your living for years to come, so design to enjoy it for a long time. From a practical point of view, wetrooms are easy to clean, they provide accessibility for children and those with mobility issues and sometimes they just look right in an awkward shape that wouldn’t fit shower cubicles or baths. 9 Practical Considerations in the Wetroom Decision. These are the key practical issues to consider in the deciding to go ahead with your wetroom. 1. You may need to get used to the bathroom feeling a little colder. 2. You do have to understand that there will be wet floors sometimes. Similarly with your sanitaryware; water can sometimes get on WCs etc in smaller wetrooms. 3. Waterproofing is a massive issue, and has to be done correctly by qualified installers. 4. 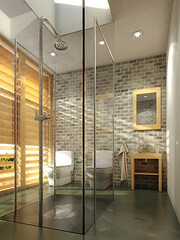 Don’t go ahead unless you have an experienced wetroom installer appointed to the project. 5. Drainage layout is very important. You really need to understand where pipes are and where waste running is running out. This should influence the position of your drains, the location of your shower head(s), WC and basin(s) etc. We will come back to this in our next article. a. Location of the drain. b. Design of the drain. c. Water evacuation capacity of the drain. d. Materials used the manufacture of the drain. e. Is a water pump being used, and what water pressure will you have? g. Size outlet of the drain. Is it compatible with your waste pipe size? 7. Tiles. Anti-slip tiles are very important; consult your tile supplier and carefully select a tile with the appropriate R Value. As a word of warning, mosaic tiles on the floor often look good initially, but over time the grout lines can turn stained and contain mildew. 8. Ventilation. This is a big issue which is often overlooked in the design and installation. As the room will be ‘wet’, it is vital to make sure that clean air is allowed to circulate and help dry out the room. 9. Lighting. If you’re using lighting in wet areas, make sure that the lights have the correct IP ratings. IP65 is required for any are which is designated as ‘wet’. Finally a lot of questions arise about underfloor heating. People ask us constantly about this factor, and whether it’s possible with wetrooms. Yes, you can definitely include underfloor heating, even directly below the shower head, with the exception of a few electric systems. Aside from keeping your feet warm in what can feel like quite a cold space, underfloor heating will help to dry out the room rapidly. Pipes for a wet system are ideally embedded into a screed, while in an electric system the mats are fitted on top of an insulated tile backer board. So, that’s its for now. In our next article we’ll deal in more detail with drainage, waterproofing, size and other practical issues that affect your wetroom. Happy designing…….. Previous PostKesmet Drain with 65mm built-in height launched.Next PostOur New Kesmet Ireland brochure is available now.